Today I’m happy to have my cousin-in-law Harold Lee on the show today. Harold is the co-founder of RockProdigy.com, a company that sells an app which teaches others how to play the guitar. Here’s what’s cool about Harold. He’s not technical at all and never wrote a line of code in his life before he started this company. But he taught himself how to code and then later drafted a world class team to help him create his app. How Harold got the idea for his guitar app. If you enjoy this podcast please leave me a review on iTunes and enter my podcast contest where I’m giving away free one on one business consultations every single month. For more information go to www.mywifequitherjob.com/contest. And if you are interested in starting your own online business, be sure to sign up for my free six-day mini course where I show you how my wife and I managed to make over 100k in profit in our first year of business. Go to www.mywifequitherjob.com for more information. Now onto the show. Steve: Welcome to the My Wife Quit Her Job Podcast. Today we are going to be talking to Harold Lee the founder of RockProdigy.com. Now Harold is actually my wife’s cousin. And to be quite honest he is actually one of my favorites out of all of Jen’s cousins. Now I actually don’t see Harold very often but when I do, we love to talk about entrepreneurship and starting businesses. 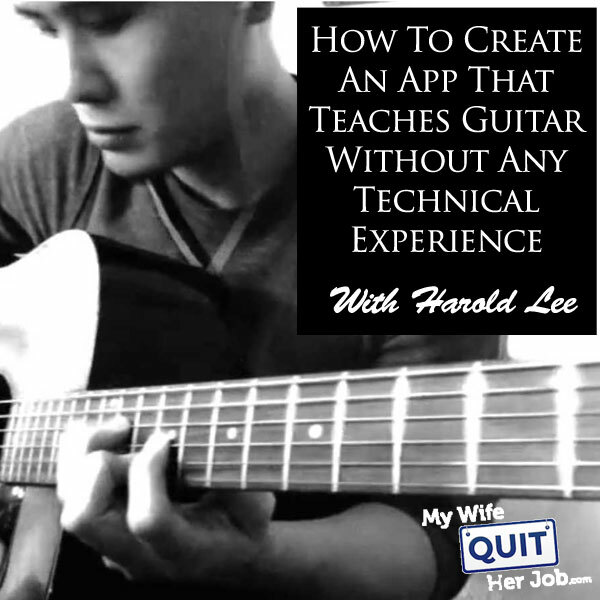 And last time we spoke Harold started the company Rock Prodigy which makes this awesome app that teaches people how to play the guitar and it’s pretty sleek. Now what’s unique about this app is that it can actually listen and know what notes and codes that you are playing on the guitar. And it actually uses this information to help you learn how to play the guitar and play the guitar better. Anyways, I’m going to let Harold explain to you the app in more details because I don’t want to get any of the facts wrong, but what I really like about Harold is his passion for playing guitar, music and it really shines with his business. Welcome to the show Harold. Harold: Thanks Steve. Thanks for having me. Steve: So, for all those who have never heard of Rock Prodigy can you just give us a quick background story and just tell us how it all got started and how you came up with the idea? Harold: Absolutely. Rock Prodigy is stuff that runs on your PC Mac or iLess device and it listens to you play guitar so you can get better at guitar much quicker. And the thought came around because I went to school at Brooklyn College of music, UC St Barbra for classical. I’ve been playing since I was the tender young age of 16 years old and- -. Steve: And you were in a heavy metal band too if I recall. Harold: Metal band I turned as a professional guitarist for a while. All the while living on instant nodules every day, hey that is the only way to do it, right. Steve: You wouldn’t be authentic if that wasn’t the case. Harold: If a good 70, 80% of your diet is not instant nodules you are absolutely a success story. So that’s why we founded the company was, we the co-founder and I felt that you know there is going to be a better way to help people learn guitar and practice guitar and stick with it, and taking advantage of the computing power, mobile devices. We just said, “Hey we can help people learn guitar and fit into their schedules wherever they are.” So if you have an iPhone, iPad, PC, Mac you can learn just and you can be practicing in having somebody listen to you while you are playing. Steve: So there is actually a lot of apps out there. I was just looking on the app store the other day. So what’s sets your app apart from the other ones that are available? Harold: There’s is two things that sets us apart. One we actually got a patent this year. It was granted January 14 but we filed it back in May 2009. So this is entrepreneurship conversation that you and I are having. So this is a proprietary technology, and in terms of what sets us apart is the quality of the content itself. What you will see with other ways of learning are not as interactive, they don’t listen to you or they are too hard to get started. With us you will be playing the guitar within the first several minutes. In addition to that the– we like to say is we like to try to hold your hand all the way through it. So we want to be with you every step of the way, much more like a just kind of a personal assistant, personal trainer, you know literally that’s our attitude. And I think it really shows when you start using our– when you start interacting with our apps. Steve: Yeah, that’s pretty cool. One thing I noticed was that your app is, as I think one of the few or the only ones that actually can listen to what you are playing. Like you can play your guitar right in front of the app and it listens and then the notes. The app actually recognizes the notes that are being played. So just kind of give me a brief walk through of how you use that technology of yours to teach people how to play? Harold: Excellent. The key behind that Steve is that the science officer of our little set of companies actually Professor of Carnegie Mellon. His name is Professor Roger Dannenberg and he’s the head of the computer music department. And if anybody is out there listening who is into the music information retrieval circles, Roger Dannenberg is actually one of the pioneers known worldwide in this field. So he and I are the co-investors of the app pattern and he is an expert at utilizing polyphonic pitch detection. And he’s done so in a way that, what that means is pitch detection will just listen to one note. Steve: Yeah, I can imagine that. If there wasn’t the– an app kind of listening to how to play, you are kind of just guessing to see whether you actually played something correctly right? Steve: And that value add is just incredible making it in my opinion a lot easier and to get feedback for actually what you are trying to play. And that’s probably what a lot of the other apps; I didn’t see do that in the app store. So that is pretty amazing. Steve: What I can’t grasp and maybe you can help me with this, is that this isn’t exactly the easiest app to create due to these listening capabilities. So how does a heavy metal band guitar player managed to create an app? Do you have a technical background at all Harold? Harold: No I don’t. You know what’s funny is that we will talk about this more but back in 2008 right, I was working at guitar centre. I was the marketing director for guitar centre for a long time. It’s a great company. I was there since the 90’s. But back in 2008– so I don’t have a technical background but the idea was so, was like “Oh my gosh we got to do this.” I just started hacking through it, like I would go online; teach myself tutorials and things like that and so on. Steve: You didn’t know him at all right? I mean it was literally a cold call when you contacted? So what ended up happening was for our first revision back in, I think mid 2010, it was so funny, I was like and I asked my wife Virginia like I literally played 100s of 1000s of notes on a bunch of different guitars and sent them over to Roger. And what Roger does is he uses machine learning to generate the optimal algorithms based on the different pick apps, based on the different guitars, based on the different musical styles, codes and things like that. And you put all this data in there and what get’s spit out is an algorithm that literally is responsive to a bunch of different guitars using a bunch of different picks apps, playing in much different styles and it’s stuff is way over my head but that’s how we got started. When he reported he said, “Hey this is actually providing a very accurate representation.” We couldn’t contain our excitement because that was the first real thing, was to make the polyphonic pitch detention work in a real time situation that can handle virtually any type of guitar with any type of pick app configuration for a bunch of different musical styles. And so it was that winter, spring and summer of 2010 where I was just playing like 100s of 1000s of notes. It was so fun. Steve: Just, you don’t really need to enter the type of guitar that you are playing, right? It recognizes any guitar, right? Harold: Yes the software right now it doesn’t matter what guitar you are playing literally. You don’t have to plug in. Like for instance an iPhone has a mic right. You can just literally sit in front of your iPhone and play and the microphone will pick it up and it will show you how you are doing. So literally if you have an acoustic guitar you don’t even have to plug in. Harold: Yeah that is something that we are really thrilled about and it’s not for the fame. So I think the original question Steve was like okay, the tech part of it? Steve: That’s pretty cool and in fact I was the same way with our online store. I didn’t know anything about web programming. But you know you just realized that you need to learn some of the stuff in order to get started. So did you write parts of your first app? So what we had to do is, we had to find a third party developer to help with a prototype. And so there was a number of stages. One was we found it in just single person to help us integrate monophonic pitch detection into an open source engine. And so this person named Zack and myself, we put together the prototype. And so back then it was done in python, python and read on a Marcus X. Now, at that time I think it was a Marcus X 10.5 or something like that. And so I literary– so for the very first prototype it was two people mostly me because he worked on one specific aspect and then I took everything else and just kind of crank, crank, crank. Steve: That’s kind of one of the other questions I wanted to ask. This isn’t your regular run in the mill iPad app. It requires a lot more technical expertise in my opinion than your typical app. So how did you actually find the right places to contract the work out to? Harold: The first major one we run an RFP process and we did research online, we contacted people. Many of them were not here in Los Angeles. We interviewed them over the phone. We asked for proposals, then we selected them that way. That is indicative or that’s kind of consistent with what we would do say out of a corporation like guitar centre where, if there was a new project we issue an RFP or anything we have we would get three or more bids. We would have a process for proposals and things like that. So we run the first one like that. We started with video game developers and went from there. Then when we brought it in house since we had a much better understanding of each of the tasks required at this specific point, it was easier to just to find individuals to help us. Right now actually in 2014, I’m pretty confident there is more people that would be able. If you started this today there is probably more people out there, the tools are better, the IDE’s are better. There is this thing called, “Android,” out there you know like it’s a completely different environment. So back in the day when we were walking up hill both ways to school, things like that and there is no underground. Back in the old days there wasn’t that many so we started out with an RFP. In retrospect I would probably wouldn’t have done it. It would probably just would have been less formal and much more sit down with a person face to face and literally be more integrated. Steve: Did you use any of the online services like elance or anything to find developers that way or was it just connections or? Harold: A combination of everything. One of the people we did find through at the time was called, “Cyber Coder.” I think they are called something else now and actually maybe even Elance now. We met a gentleman named Ellen through there who worked with us full time for several months. He was a fantastic person; he was here in Los Angeles. A lot of it was word of mouth; we tried craigslist which I don’t recommend. Don’t do craigslist. Bur a lot of it was somebody knows this person, they know that person and that person knows this person. And then what we also did was we kind of looked at the boards on UCLA, USC, C-son so on and so forth and so kind of starting with the University in mind. Those are the ways we kind of found the people that worked with us, yes. Steve: So now you have this really awesome app. What’s the business model to become profitable? What’s the strategy? How do you get this app in the hands of the people, how do you make sales earlier on, what was your strategy for that? Harold: I would love to tell you the strategy but it didn’t work. And so we are here today because we literally started out with one thought that we will be able to kind of have this sell, give you the razor so you buy the blades type thing. It didn’t really work out that way. We started out with a much different emphasis which was to play songs. We thought we could get back Prodigy and you would then spend a lot of songs; buy a lot of songs from us to play within our Prodigy. It’s not an illogical thing and there were for instance at the time there was rock band, there was guitar here and there were other kind of music games out there that were talking about how that model was working for them and so that’s how we started at. And it didn’t yield the return; there were so many different aspects about that which was… When you sell songs people focus on the songs you don’t have than the ones that you do I suppose than you do. And then because of the iTunes culture at that point was, you know people were– people had an expectation of either not paying for songs or paying you 99 cents for a song, which didn’t work economically. Steve: You have to get permission for these songs too, don’t you? Do you have to pay the record labels or? Talking to the label not that much of a problem but literally on the composition side everybody who was in the band at that time owns a little piece of that song. So you actually have to go and hunt down everybody in the band at that time to get permission to use their song. Harold: Yeah and it turns out that unless you had a department or you can outsource to a company who will do that for you to literally track down all of the different rights holders for any one composition– because it really absorbs a lot of your resources and expenses in time. Steve: Is that what you did? Harold: Yes, we started as a combination of doing stuff in house as well as hiring a very young and small really quick company to help us track down the licensing. Another thing of saying, not for the faint of heart. Steve: Yeah, totally. Plenty of barriers to entry and making one of these types of apps already. So, I interrupted you though. So you are talking about initially you had the razor blade model but that didn’t work out? Harold: Well it didn’t return the way we had projected. The best thing that we ever did was we invited a few people into our office at the time, they came in, we put the app in front of them and we left the room. We turned on the video recorder and we just sat there and they interacted with it, with no help from us. We literally pulled these people off the street and said, “Hey are you interested in playing the guitar?” They said, “We would love to.” We said, “Come on in.” And we sat them down, gave them guitar and then literally left the room and that was the most important thing I think we have ever in our entire company because at that point we literally learned, oh my goodness all of the things we assumed, all the things that we took for granted, every step along the way was oh my gosh, we are doing this wrong. Only because it was so unfiltered. It was so– these people had no reason to like what we were doing or hate what we were doing. They didn’t have any attachment to us and just sitting there and watching kind of how they stumbled because our interface for them really fell short, that was the thing. The reason why that was important was because that lead us to really focus on where we are now which is music education because so from watching the people, getting emails from them, interacting with them through our support desk, through the facebook and we did a number of kind of small surveys. People were telling us, “Hey we want to learn, we are beginners, can you help demystify that for us?” So that’s where we are going to focus on. Now we are a different company. Steve: Do you still have to buy the songs though. So, describe how it’s changed? Harold: We used to have a free app, right and there was a free new model. You download it for free and then you pay for stuff, right. And so now you can actually still download it for free but how it’s changed is, we instead of songs, instead of having 100s of songs which we have 100s of songs in, but we also have what we call, “Guitar courses.” So you can take guitar course one, course two, course three, course four. A lot of it present like [Inaudible] [00:26:15] and that’s where the revenue comes from is that there is really nothing like it. Steve: So you are charging a premium for these lessons is that correct? You download the free app, you get charged for the lessons? Steve: So how do you get around the barrier that like in my mind I don’t pay more than like five bucks for an app. Is your app, are these inner purchases priced similarly or? Harold: Yeah the course one is 2999 which is a temporary price. It’s actually if you, the retail price is 4999 so you can– so right now you can get it for 2999 but it’s temporary. So each course is 4999 right now but if you buy all four you would get it at a bundle price for that. Now so the story behind that is when we started at free, then when we found out people want to learn we started putting it in the bundle content. Then we said, “Maybe it’s a 99 cents app.” Maybe its 99 cents, maybe it’s about 99 and so we kept raising the price. This is an entrepreneurial conversation. So I’m not sure that’s the best way to do it. I also have an MBA also so I’m breaking all the rules like Steve. I’m throwing all the rules out there. I’ve got a total MBA, UCLA wherever, it’s all good but all the rules got in there. So we kept raising the price, and I think we just landed on a nice price of 4999 and right now it’s 2999 but 4999 per course. Steve: Okay, so how do you get like I said before, earlier in this interview. There is a ton of guitar learning apps out there. So how do you guys get customers in the door to download your app? Harold: Right now we really rely on word of mouth and reputation. It turns out that we don’t have a big footprint. What we have done that’s allowed us to kind of swing above our weight is to use kind of a boxing metaphor, right, boxing technology whatever similar or wherever you want to call it, is we actually have a partnership with Fender. We got– last year we started being included in some of their packs. We are carried by Amazon guitar centre and those are– those are ways where we don’t– there is not a lot of cash outlay to get iBalls and so for us it was really about developing the relationships with them. Well I had a lot of experience because I was at the guitar centre for so long. And just working with them to see how we can help what their objectives are. And so for Fender it’s more about yes, we would love for people to play guitar more, if it gets easier for them to start. So we felt a good synergy there. So that’s how we kind of get the word out there right now. We spend very little if we spend anything at all on advertizing which is ironic since I was the director of marketing that’s all I did. All I did was spend money and so it’s ironic we don’t do that. We haven’t been doing that. I think after we get our– after this year what you will see it’s a much more kind of outward phasing campaign to get people to try us. But right now literally we are just focusing on making the product the best it can be with what we have, and which means a lot of long days and nights for everybody who is on the team right now. So that’s kind of what we do. Steve: So this relationship with Fenders so when someone buys a guitar do they get, do they refer you to the app? Is that how it works or…? Harold: Right. We are currently included in the Fender DG-8S Acoustic Guitar Pack and that’s a very quality entry level guitar. So if you are just learning guitar and you want your first guitar the Fender DG-8S is really good because one it’s a Fender, it will stay in tune, it’s easy to play. If you have ever tried guitar you will know that they are guitars that are quote out there that don’t stay in tune and they are really hard to play. This one is a Fender, so it’s literally like a standard you can rely on. So, if you get that guitar pack, it comes with Rock Prodigy. Now, so that’s how we are currently packaged in their bundle. Steve: That’s pretty smart. So if I can just summarize what you’ve just told me. Up to this point you’ve been primarily focused on product development. And you have a couple of partnerships here and there that get people to download your app. This year you are going to be focusing on proliferation now, is that pretty accurate? Harold: Yes, that is cool. Steve: Okay. This is the year Harold. Steve: I forgot to ask you this. I mean you left a pretty good job right, to start this? Harold: I’m telling you I was at the guitar centre for I think 13, 14 years and I was stalked. That’s a pretty cool job. I’m like yah you get to sell guitars, you get to do music, you get to– but this was just to– now that we are doing it, I can’t imagine doing something else. Steve: Great, so if you had any advice for people who wanted to start like an iPad app, do you have one single piece of advice to give them based on your experience? Harold: Yeah, I would say pretty much don’t do what we did. Don’t follow in my footsteps, don’t follow our footsteps. The advice due is draw it out. Take a few pieces of paper draw out literally on that paper. You can use Microsoft word or wherever but literally it’s going to be, “Hey this is going to be screen one, this is going to be screen two and sit with people. Let them poke holes in it, let them– so before you spend a whole bunch of money or before you waste a network. Before you spend a lot of time to imagine this shining utopia of whatever you are designing to do, a lot can be– you can learn a lot by just saying, “okay, hey this is what it’s going to look like in getting the reaction from there.” What I found myself doing a lot was like, but it’ll do this, but it’ll do that. If you find yourself doing that a lot, then just be prepared that you are going to have to probably spend a lot of time flushing that out when you don’t know if it’s really going to be what people want. So, if you want to start an app, start as cheap as possible and then that will help. So, don’t do what we did. Steve: That’s actually a great piece of advice because so I run a course and a lot of people go in to do web design. They hire a developer but they don’t really have a crisp idea of how they want everything to get laid out and they give broad generalizations to developer and before you know it what they produced isn’t what the person was expecting. So yeah, you are right, it’s absolutely important to put everything down and have a little blue print of how everything is supposed to work before you start. Harold: That’s a great example. Steve: So I would like to end this interview since I’ve taken up a lot of your time. What is, is there any book that you would recommend that kind of got you fired up to take the courage to start this business? Do you read Harold? Harold: What is this thing called reading, why do people keep on talking about that? I think for me what we keep coming back to and it’s not necessarily to get fired up about it but it’s more about what to do if you are fired up. ‘Crossing the Chasm’ has been, it turns out it keeps being true, right. So, like there some mentoring books like ‘7 Habits’, there is ‘Eating the big fish’, there is a bunch of management books, right and they are all true. Like there are true things that they tell you to do but in terms of now that we are fired up and what you can apply to literally what your customers are experiencing, for me ‘Crossing the Chasm’ just keeps ringing true. Like if you don’t think about it for a week, you’re the next week you will come up something and you will be like, “Oh my goodness this is one of those things they talked about in crossing the chasm.” And it just keeps popping up. Steve: Okay, awesome. Well, hey Harold I don’t want to take too much of your time. If anyone has any questions about Rock Prodigy, is there a place where people can reach you? Steve: Okay and then in the show notes I will go ahead and put a link to your app and then include your email address and a link to your favorite business book as well. So, hey Harold thanks a lot for giving us your time today. And you know the best of luck to you and your app. I think we want our daughter to actually learn how to play the guitar. So maybe we will download the Rock Prodigy and fire it up. Harold: Steve, thank you so much, and I will see you soon. Steve: Yeah definitely, in the next family function. Harold: Thanks so much Steve. Steve: Here is what is awesome about Harold. He was a guy who wasn’t technical at all. Never programmed a single line of code in his life and here he is put together an incredibly complex application to teach people how to play the guitar. For more information about this episode please check out the show notes at mywifequitherjob.com/episode16. And also if you enjoyed listening to this podcast please go to iTunes and leave me a review. When you write me a review, it not only makes me feel proud, but it also helps keep this podcast up in the ranks so that other people can use this information, and find the show more easily to get awesome business advice from my guests. It’s also the best way to support the show and please tell your friends because the greatest compliment you can give me is to provide a referral to someone else either in person or share it on the web. As an added incentive, I’m also giving away a free business consult to one lucky winner every single month. For more information go to mywifequitherjob.com/contest. And if you are interested in starting your own online business, be sure to sign up for my free six-day mini course where I will actually show you how my wife and I managed to make over 100k in profit in our first year of business. Go to mywifequitherjob.com for more information. Thanks for listening. Thanks for listening to the My Wife Quit Her Job Podcast. Where we are giving the courage people need to start their own online business. For more information visit Steve’s blog at www.mywifequitherjob.com. This was both motivating and inspiring. I think it’s awesome that he was able to create this new technology (the polyphonic pitch detection), work the patents, and clear all the other hurdles with the software development. Working a deal with Fender and Guitar Center to include their software with purchases could have filled its own podcast! Very cool!